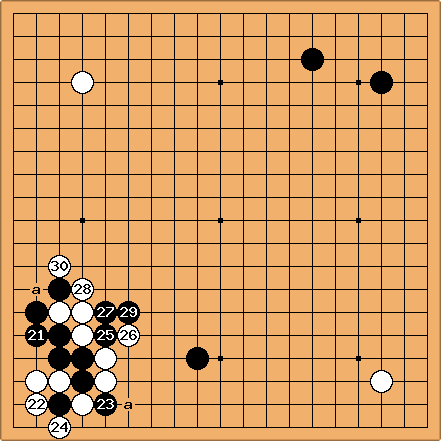 Dieter: White is Cornel Burzo, Black is Noguchi Motoki. I know Cornel as the teacher of one of my friends. Against lower dan players, he can find the most amazing sequences. I found it very instructive how Motoki calmly dealt with his challenges. It looks very simple, almost as if I were able to play like this myself. is the 3-4 point, low approach farthest pincer. The usual pincer is at a. looks very much like the 3-5 point, low approach, press variation. It is, to my eyes, a strange choice, since any wall will be neutralized by the far pincer. A two-space jump at b is more logical. I would be interested to know why Cornel chose to press. Incidentally, there are 4 pro games up to . 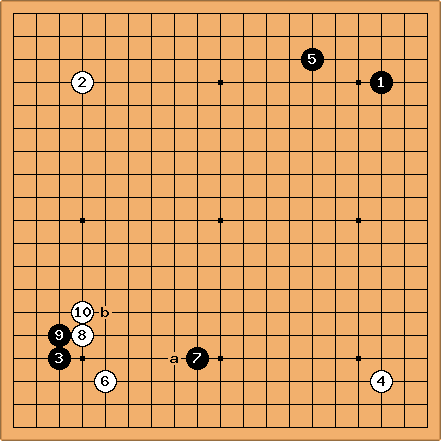 White invariably plays and Black pincers high (but one space more to the left, that is at a, one example being the first game of the 13th Tengen title match) in three cases. calmly connects and leaves the choice to White where to suffer the damage. looks like a big mistake. I think a would have been better but still advanhtageous for Black. 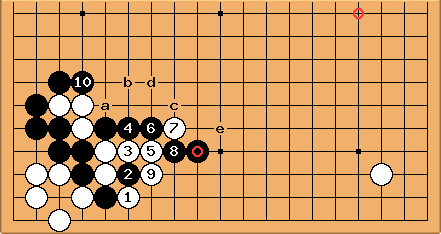 Tapir: White can either push at (likely in sente) before drawing the attachment stone out with - this seems to be a current line of play - or alternatively play at a. Having the initiative with , I'm quite sure Black has the lead here. painfully exposes the lack of real strength in White's position (I wouldn't have thought of it that way before seeing . One tends to overestimate the power of ponnuki sometimes). dia. 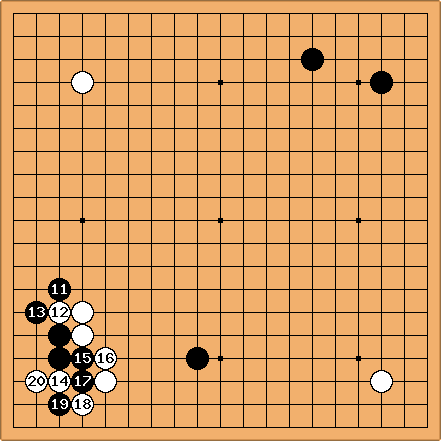 : If here instead of two diagrams ago, there would be more aji in the ladder. 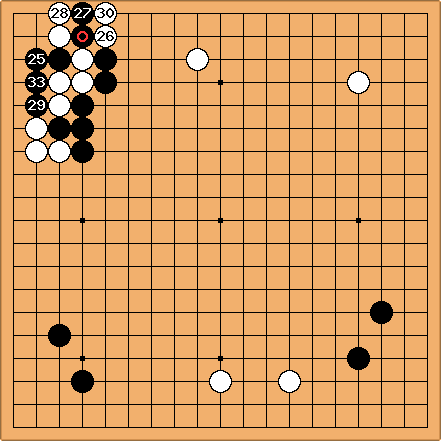 Still, I guess capturing three stones is big fow Black, and his marked stone is not too affected. tderz: This is a geta and therewith better than a ladder..
Dieter: Yes, but I am not sure that the cut at is desirable for Black. tderz: That's why I labelled already the letters c to e. (Dieter: Yes I noticed, so we only differ in judgment) The evaluations of this white threat c to e will differ ( or at is not yet played) from player to player. To capture cutting stones in Geta looks attractive to me. Black has already cashed in, while White still had to come up with a plan to harras + in an effective way. We could start a sub-page from here. 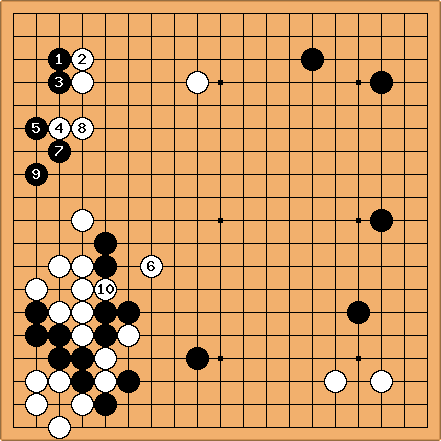 tderz: If white wants to escape the geta, there waits another ladder a for her. 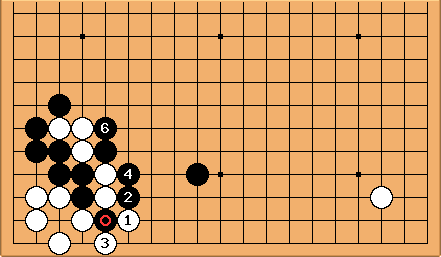 I do not have formed an opinion right now on which ladder would be preferable (depends on top right aji). 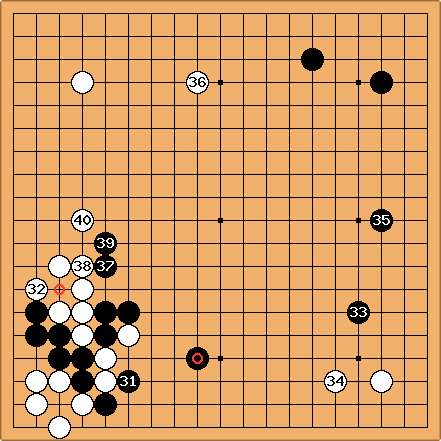 however the connection at threatens the geta -g again and White had to do the ugly push . 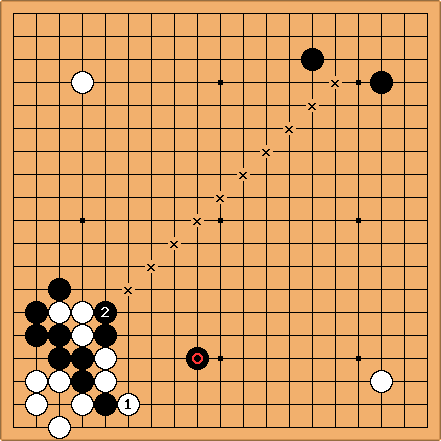 (On the other hand, Black is divided into two groups, which might give White a chance. tderz: Seeing the direction of this ladder heading to the middle of the top-right black ogeima shimari, I might prefer the former editors original ladder in dia  above. It will have less bad aji vs. black. 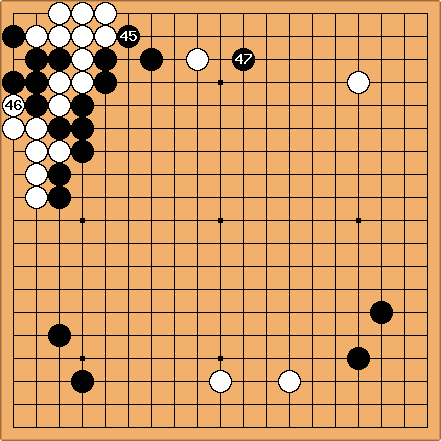 Black could still revert to the ladder of dia , but then and are aji-keshi. Dia's right edge of the ladder projects at the shimari at x, above's ladder at y.
Dieter: @ . Still, there is a plain ladder, and White has sente. Better for Black, but no net. But I refer to the above diagram, where the net has the cost of the pincer stone being severely cut off. is an unusual but possible variation to the 3-3 point invasion. looks like a mistake. Black calmly hanes at . After establishing a safe position at the upper left, Black takes another big point at . One cannot help feeling that White is being pushed around. 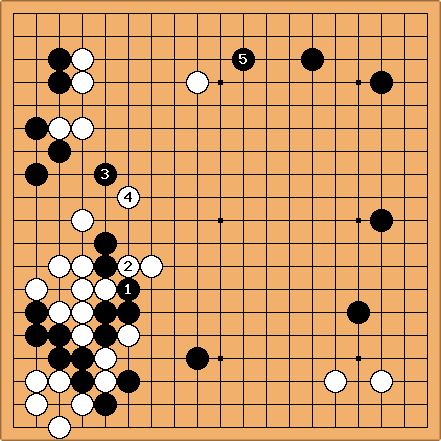 Tapir: I like this line of play, because it demonstrates what is at stake with the simple push . Black can choose a wholly different game nothing forces Black to insist on living in the corner. In fact the corner is pretty small w/ only 16 points of territory.